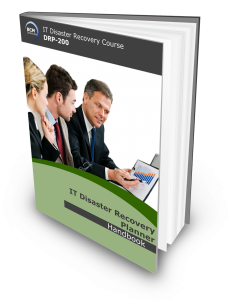 DRP-200 is an intermediate 1-day IT Disaster Recovery Planning (DRP) course with an additional one and a half (1½) hour 50-Multiple Choice Question (MCQ) based electronic examination, following the completion of the course. This foundation course is designed and developed for IT Disaster Recovery (DR) Managers and Planners, IT Professionals, dealing with the specific area of the DRP process, any IT professional embarking on their IT DRP career. Participants will be introduced to the key concepts of developing business continuity and disaster recovery strategies, design and implementation of DR plans, preparing and conducting awareness and training programmes. This course is a pre-requisite course for the DRP-300 course. Participants are strongly encouraged to pursue DRP-300 course unless the members are only keen on understanding the DRP concepts only. DR Certified Planner (DRCP) Certification is awarded to participants who successfully completed and passed the Qualifying DRCP examination attached to the course. Under the fundamentals of IT DR, crisis management and business continuity management. Assess risk to IT and technology related components within the IT environment. DRP-200 is designed for System Administrators and Managers; Database Managers and Administrators; DR Coordinators; Project Managers involved in application development, systems and network implementation and support; systems support engineers and consultants. This course incorporates a 50-Multiple Choice Question Qualifying Disaster Recovery Certified Planner (DRCP) electronic exam on the next day. The duration of examination is 1 and 1/2 hour. Candidates who achieve with a passing score of 75% or higher are eligible to apply for the BCM Institute’s Disaster Recovery Certified Planner (DRCP) accreditation. The examination fee is included as part of the course fee. This course fee does not include application processing fee for the DRCP certification. The course fee includes the DRCP examination fee. BCM-600 Technical Courses (Non-certification Technical Courses).